This unsettling tale centers on the unfortunate Madeline. She loses her husband and her unborn baby in a car crash but decides to carry to full term. Her baby daughter is still born but a few moments later she miraculously returns to life. Painfully for Madeline her daughter, the eponymous Grace, seems to have peculiar tastes and certainly isn�t like the other babies. This is slow, brooding and really creepy. Director and writer Paul Solet plays around with the idea that Madeline may be going crazy and a midwife with a crush is stirred into the mix along with a nasty mother-in-law to make things more interesting. 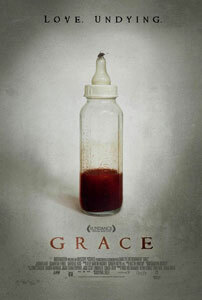 It is an unpleasant film to watch, especially if you have a baby in the house or worse, you're pregnant. It captured my attention and it was well made but I can't say I enjoyed it.